full of exuberant bird chatter and song. This past several weeks I have had a very interesting avian visitor in my back yard. He arrives in the early morning around 7am and perches on top of a near by tree limb from which he surveys the yard. With a sudden "whoosh", he flies into the yard and lands on the top of one of my three aviaries. 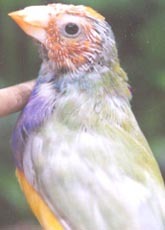 The tiny Gouldians are terrorized with fright as he tries to reach them through the wire of the aviary. His body is long and his bright yellow legs and feet look powerful. 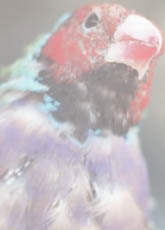 He has a brownish back and a light breast marked with splotches and streaks. His tail is square at the end and has several dark bands across it. 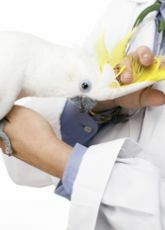 His beak is sharp and is hooked at its tip. 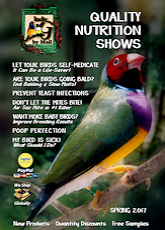 This is no gentle seed-eater; he is a predator who feeds on other birds. I have learned that he is an immature Cooper’s Hawk. His repeated attacks on the aviaries caused two pair of breeders to abandon their clutches. Determined to save my Gouldians from this predator, I set out to make him find another feeding ground. 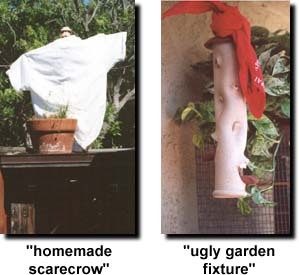 Using an old T-shirt, a garden pot filled with dirt and two perches, I designed a scarecrow and placed it on top of the aviary. I wrapped a red neckerchief around an ugly hanging garden fixture right in front of the flights that he loved to terrorize. I was convinced this would scare him from entering the yard again. At 7am the next morning he was back. I could not believe that everything I did to frighten him had no effect. I couldn’t believe my eyes. I grabbed my camera and started to shoot. He landed right next to my scarecrow, looked around for a couple of seconds and immediately flew past the ugly garden fixture and onto the Gouldian nest box hanging on the outside of the flight. He hopped onto the top of the cage. I was standing in the kitchen not three feet from him. He looked right at me and began to attack the Gouldians cage with his beak and claws. He flew back to his tree after I yelled at him. Then a friend told me about the Bird Alarm. 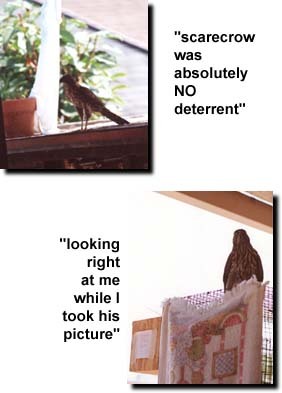 I hung it over my cage and the Cooper Hawk has never been back. And that is just fine with me!